Jerry and I were going to ride the ACA Texas Hill Country loop in our coroplast faired trikes in February, near Austin, but Jerry got sick, so its been postponed or canceled. Maybe you could ride with us, its about 320 miles around. Let me know when you're in my area. I won't be able to make it over to Texas anytime soon. I do not know when I will have a body back on it either. I took it off last month to remove a crankarm set that got stuck when I was replacing the 165mm 28/38/48T with a 152mm 22/32/44T, and the shell was already tired and falling apart and starting to wobble. I've decided to wait until the next one is ready before having a body on it again, whether it happens to be the in progress aluminum one at my friend's shop or the in progress coroplast one at my mom's house. Jerry planned to show up and ride with me before I left Corpus Christi, but for whatever reason that fell through. Its exactly the opposite of what you describe. A long nose coupled with a lot of trial is not good. Maybe Matt Weaver never rode in gusty 20 mph cross winds, but I can tell you from experience that the side forces are coupled directly into the steering and the more trail, the more torque has to be input to the steering to correct. The smallest nose in the front is best for side wind stability. I once tried 12 inches of trail, and when I put the fairing on it was almost unridable. The wind pushes and trail turns the steering away from the wind, not into it. Negative trail would do what you are saying. Matt did far better in crosswinds than any who rode before him, because the aero reaction was instantaneous, and set up the proper lean to counter the gust. However, bicycle stability is a many factored thing, and if you have found a better combination with a shorter nose, I'm delighted. arcosine probably finds it's less stressful to not have to constantly shift his body weight around at the dictate of random gusts, making the machine more ridable for him as a result. Matt had no room to shift his weight, but I'll leave further answers to him, if you can dig him up. I am aware of Matts designs, well ahead of his time. With a high cross wind, the bike is a an angle leaning into the wind, and the faster you go the more it pushes, 30+ mph with the brakes on. Anyway, the best is when the CP and CG are close, but in a faired bike the CP is usually ahead of the CG. I once had ny LWB pretty well balanced in cross winds, then I added touring gear behind the seat, moving the CG back. Even though the bike was heavier, it was less stable. Ive heated crank arms with a propane torch, then pry it up an the same time hitting the aluminum near the square taper with a hammer and it will pop off, that is if the threads are messed up where the crank arm puller wont work. Heating with the puller works too. A final factor that strongly effects the controllability of a streamlined bicycle is sidewinds. Those familiar with using front-wheel disks know that side winds can produce some unpleasant torques on the steering. Similar, yet much worse, are the lifting forces on a typical streamlined bicycle moving along in excess of 40 mph.The force vector points predominantly to the side and slightly forward. This means you might get propelled forward a little, but most likely you'll get blown over.There is neat solution, however. Ifound that by properly setting the geometry of the bicycle relative to the fairing and its associated center of pressure (the imaginary point on the fairing where the resultant aerodynamic lift force acts), the bicycle will automatically lean into a good range of side winds. 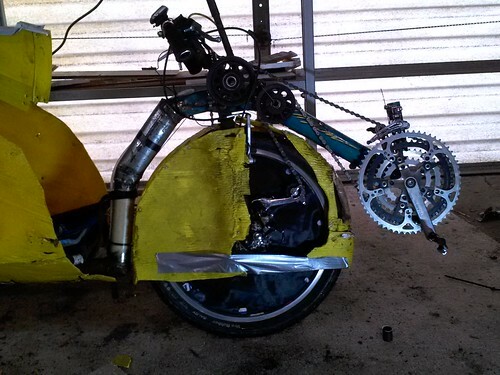 This results from steering torques induced by wind pressure, causing the bike to momentarily steer away from the wind, and thus generate a lean into the wind. The trick is to try to tune this as best possible. The numerical model discussed previously can be used to analyze this, where the configuration of such a bike is characterized by the front wheel being relatively far back from the nose. The Cutting Edge approximates this; however, it actually over compensates a little -I find myself gently steering out of a lean into the sidewind. So the bike " momentarily steers away from the wind". yes this is not ideal in heavy winds. I always have to steer into the wind, other wise the bike will blow over. Last edited by arcosine; 01-28-2019 at 06:58 PM.. Went on a test ride with the nopsa president.